For the 15th consecutive year, Canadians will be focusing their attention on pool and water safety during Drowning Prevention Week, which runs from Saturday, July 17th to July 24th. Educational programs will focus on the importance of wearing a life-jacket, avoiding alcohol while swimming or driving a boat, and taking swimming lessons — especially when young. The timing, experts say, couldn't be better. That's because a nationwide spike in the number of drownings this year has raised concerns. As of Wednesday, there were a reported 187 drownings across Canada in 2010, in comparison with 161 deaths by the same period in 2009. 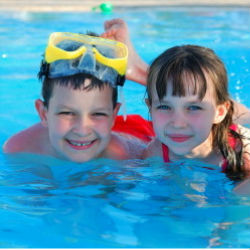 To read more about how to teach your children about the importance of water safety, click here to access a host of articles and resources made available by the MCH's Trauma Department. For more information about water safety courses and swimming lessons available in your area, click here to be directed to the Lifesaving Society's website.